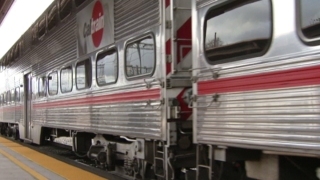 A Caltrain struck an unoccupied car on the tracks in Burlingame on Thursday morning. Caltrain officials tweeted around 10:30 a.m. that southbound train No. 138 had hit the vehicle at Broadway. There was no one in the car at the time of the collision, and no injuries have been reported, they said. Officials said a woman, who was driving the wrong way, ditched her car on the tracks and jumped out when she saw the train approaching. A tow truck removed the car from the tracks just before 11:15 a.m, Caltrain spokesman Will Reisman said, and train No. 138 headed south again, scheduled to make all regular stops en route to San Jose. Reisman estimated that there were 170 passengers on board. Other trains were forced to use a single track after the crash.